What causes algal blooms to become toxic? Home / 2017 / August / What causes algal blooms to become toxic? 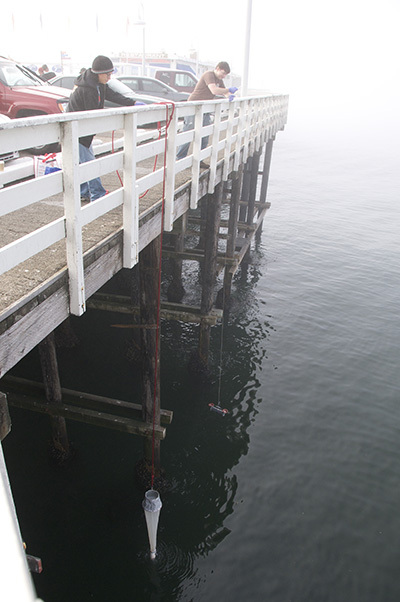 Ocean sciences graduate students Terrill Yazzie and Michael Kempnich collect samples of seawater and phytoplankton from the Santa Cruz Municipal Wharf. The disastrous 2015-16 Dungeness crab season, delayed and shortened by an unprecedented bloom of toxic algae, is a bitter memory for the West Coast fishing industry. The culprit was domoic acid, a potent neurotoxin produced by marine algae and discovered in 1987 as the cause of amnesic shellfish poisoning. Scientists at UC Santa Cruz have made substantial progress in understanding and predicting the conditions that lead to large blooms of the toxin-producing algae (diatoms called Pseudo-nitzschia). But one aspect of these toxic algal blooms, which affect wildlife as well as economically important fisheries, remains a mystery: how do the algae make domoic acid and what triggers its production? Marilou Sison-Mangus, an assistant professor of ocean sciences at UC Santa Cruz, explains that the algae do not always produce the toxin. "There are blooms of Pseudo-nitzschia every spring and summer along the California coast, but the toxicity varies a lot," she says. "For the seafood industry, this toxin can have a big impact, so we want to understand the mechanisms behind its production. It's a 30-year-old question." A new grant from NOAA's Ecology and Oceanography of Harmful Algal Blooms (ECOHAB) Program will fund a research project led by Sison-Mangus to answer that question. Her co-investigators on this interdisciplinary project include chemistry professor Phil Crews and statistician Juhee Lee, assistant professor of applied math and statistics. The NOAA grant provides $130,000 per year for three years, but only the first year of funding is guaranteed. Funding for subsequent years depends on the availability of future NOAA appropriations. Sison-Mangus's lab at UC Santa Cruz has been investigating the role of bacteria in the production of domoic acid by algae. It turns out that Pseudo-nitzschia itself does not have all the genes needed to synthesize the toxin. "We think one of the precursors needed for domoic acid synthesis is produced by bacteria," Sison-Mangus said. "If that's the case, we may be able to use the presence of the bacteria as a marker to predict the toxicity of the algae." Previous experiments by Sison-Mangus and others have shown that bacteria-free cultures of Pseudo-nitzschia are not able to produce domoic acid, while adding bacteria to the cultures restores toxin production. She has found that marine bacteria in the phylum Bacteroidetes, alone or in combination with other bacteria, consistently induce a big spike in domoic acid production in cultures of three different Pseudo-nitzschia species. Sison-Mangus has also monitored algal blooms in Monterey Bay and found a close correlation between domoic acid levels and the presence of Bacteroidetes bacteria in association with Pseudo-nitzschia. 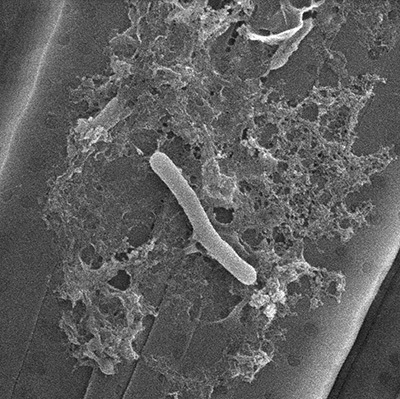 Electron microscope images show the bacteria living on the outer surface of the algal cells. "We know these bacteria are associated with toxic blooms the ocean, and we know they cause toxicity to spike in the lab, but we don't know the mechanisms of toxin production," Sison-Mangus said. One part of the new research project will focus on unraveling the details of how algae and bacteria interact to produce domoic acid. Another part of the project will use monitoring data from Monterey Bay to assess how this interaction fits into the larger context of the many physical and environmental factors, such as water temperature and nutrient levels, also known to influence toxic algae blooms. Sorting out the effects of multiple factors, all varying simultaneously in a complex system, is a challenge. But this is Juhee Lee's area of expertise, and she has developed a Bayesian statistical modeling approach that will help the researchers understand how all these factors interact to influence the development of a toxic algae bloom. The results of this research may be incorporated into existing predictive models for forecasting Pseudo-nitzschia blooms and domoic acid levels, developed at UC Santa Cruz by ocean sciences professor Raphael Kudela and research scientist Clarissa Anderson.